Freshman Taurean Thompson played more minutes at center than originally anticipated. 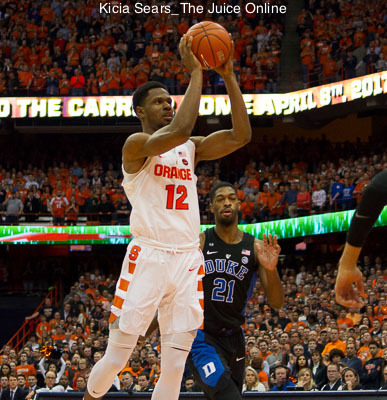 Over the course of the 2016-2017 season, it became obvious that Syracuse’s calling card, a 2-3 zone defense, was nowhere near where it had been for the previous several years. A weapon that normally suffocates opponents, forcing bad three-point shots and enabling the Orange to get easy fast break points off turnovers, the defense was uncharacteristically weak. There was no single problem Jim Boeheim could point to, solvable with a quick fix or a patch job to make the defense passable. Instead, a myriad of issues made the zone easily beaten far too often. The primary culprit was a mostly inexperienced roster that devolved into an even more inexperienced one. On paper, SU had a very experienced roster coming into the season with two graduate transfers, a redshirt senior, and a senior, but by the midpoint of the schedule, the team did not look like that on defense. For defensive purposes at SU, the two graduate transfers were freshmen. Redshirt senior DaJuan Coleman went on the shelf, paving the way for true freshman Taurean Thompson to get extended minutes at center. Add Tyus Battle as a true freshman and Tyler Lydon as a sophomore and the defense was a lot younger than its listed age. The frontline of the defense featured John Gillon and Tyus Battle, who had zero minutes at SU before the season. Gillon is listed at 6’0”, which is shorter than most guards who have played up top previously, as well as most guards he played against. That allowed open looks at three-pointers, especially when closeouts were slow or without a hand up, as well as clear passing lanes, including to the soft spot of the free throw line. Andrew White III was new to the 2-3 zone, as well. And, possibly in part due to the offensive load he carried, his defense left a lot to be desired, as well. Slow closeouts. Poor rotations. Occasional interest in rebounding. All of them hurt the Orange. Until he committed a mistake that merited the hook from Jim Boeheim, Taurean Thompson was on the floor for offensive punch. While Thompson was a pretty fair rebounder, he often got beat on defense. 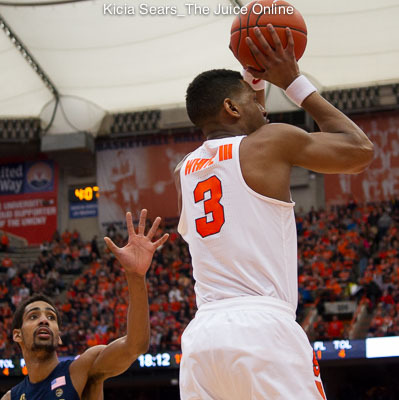 But, once Paschal Chukwu and DaJuan Coleman were injured, Boeheim had limited options. Subsequently, Boeheim rode players with the highest offensive upside. Frank Howard went into mothballs for Gillon’s offensive outburst potential. Tyler Roberson stayed on the bench longer to give Thompson a chance to add offensive punch to a team that won games by outscoring opponents. SU went 9-4 in ACC games when scoring at least 70 points and 1-4 when they did not. The Orange gave up 78 points a game when they failed to score 70, a number that looks better because Virginia only scored 62. The numbers back up this up, too. To compare, the last eight years of SU basketball show how wide-reaching the problems with the Orange defense were last season. Using that many years permits a comparison to a large number of teams and personnel, as well as showing changes from when Syracuse jumped from the Big East to the ACC. First, the Orange were abnormally mediocre at defending the three-point line. With three of the four players defending the perimeter being new to the system, it makes sense that they would be exploited. Making that worse was that SU opponents shot a higher percentage of three-pointers of all field goals than ever before. 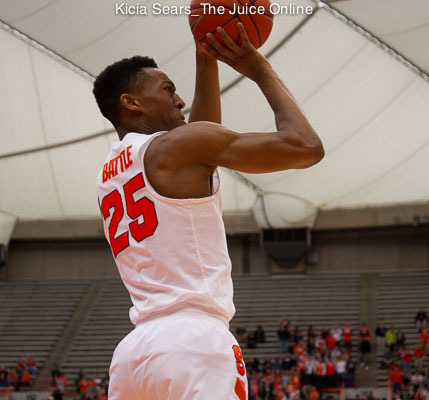 While there has been an overall shift toward the three-pointer in basketball, it was even more pronounced against Syracuse. The zone always forces three-pointers. Of course, it ideally gives up bad threes from well behind the line and/or late in the shot clock. This season, marked by slow (or non-existent) closeouts and poor rotations, that was not the case. Three-pointers create long rebounds more likely grabbed by the offensive team. The stats bear it out, too. In short, the Orange briefly benefited from its change in conference affiliation, as it took the rest of the ACC a couple years to catch up to what Big East teams knew – send guys to the offensive glass. That temporary advantage is gone. The zone also did not force turnovers at the rate it normally does. The zone normally forces a turnover on a little more than one of every five possessions. Those turnovers take opportunities for points away from the opponent and give them to SU. To really illustrate how this season was a perfect storm of bad defense for Syracuse, let’s compare stats between this season and 2013-2014, the team that went 25-0 to start the season and finished 28-6 and second in the ACC. While these two squads were pretty close in field goal percentage allowed and had a very similar three-point percentage allowed, the 2013-2014 group had a significantly better defensive rebounding percentage and also forced more turnovers. With Rakeem Christmas, C.J. Fair, Jerami Grant, and Baye Moussa Keita, the Orange were slightly below average on the defensive glass. While that does not sound impressive, it is a lot better than being almost the worst. Add on a worse turnover rate and it is easy to see how the Orange were a perfect storm of bad defense this past season. This past season, Syracuse gave up 1.015 points per possession, which ranked 178th in the country, or just about average. That 2013-2014 squad gave up 0.948 points per possession, which ranked 31st nationally. This year’s bunch gave up 71.1 points per game, good for 129th in the country. If they had the 2013-2014 team’s defensive efficiency, that would be trimmed to 66.4 points per outing, which would have moved SU to right outside the top 40 in the country. It is all little things with the 2-3 zone. But, they add up to big things. It’s just that this season, the big things often ended up on the opponent’s side of the scoreboard.